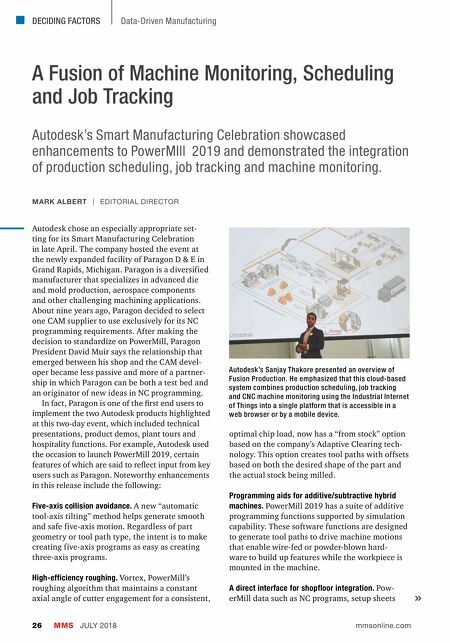 DECIDING FACTORS MMS JULY 2018 26 mmsonline.com Data-Driven Manufacturing A Fusion of Machine Monitoring, Scheduling and Job Tracking Autodesk's Smart Manufacturing Celebration showcased enhancements to PowerMIll 2019 and demonstrated the integration of production scheduling, job tracking and machine monitoring. Autodesk chose an especially appropriate set- ting for its Smart Manufacturing Celebration in late April. The company hosted the event at the newly expanded facility of Paragon D & E in Grand Rapids, Michigan. Paragon is a diversified manufacturer that specializes in advanced die and mold production, aerospace components and other challenging machining applications. About nine years ago, Paragon decided to select one CAM supplier to use exclusively for its NC programming requirements. After making the decision to standardize on PowerMill, Paragon President David Muir says the relationship that emerged between his shop and the CAM devel- oper became less passive and more of a partner- ship in which Paragon can be both a test bed and an originator of new ideas in NC programming. In fact, Paragon is one of the first end users to implement the two Autodesk products highlighted at this two-day event, which included technical presentations, product demos, plant tours and hospitality functions. For example, Autodesk used the occasion to launch PowerMill 2019, certain features of which are said to reflect input from key users such as Paragon. Noteworthy enhancements in this release include the following: Five-axis collision avoidance. A new "automatic tool-axis tilting" method helps generate smooth and safe five-axis motion. Regardless of part geometry or tool path type, the intent is to make creating five-axis programs as easy as creating three-axis programs. High-efficiency roughing. Vortex, PowerMill's roughing algorithm that maintains a constant axial angle of cutter engagement for a consistent, optimal chip load, now has a "from stock" option based on the company's Adaptive Clearing tech- nology. This option creates tool paths with offsets based on both the desired shape of the part and the actual stock being milled. Programming aids for additive/subtractive hybrid machines. PowerMill 2019 has a suite of additive programming functions supported by simulation capability. 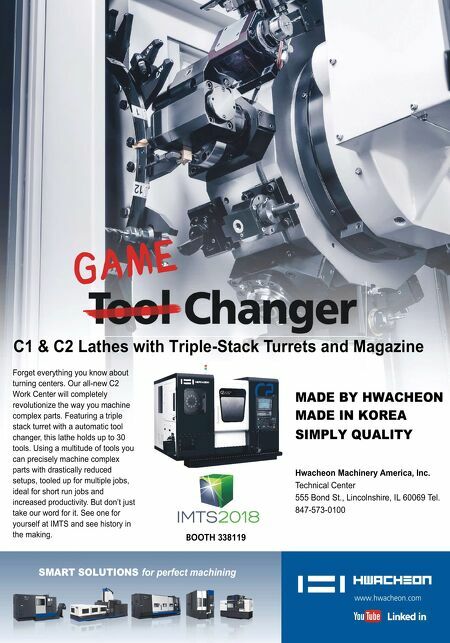 These software functions are designed to generate tool paths to drive machine motions that enable wire-fed or powder-blown hard- ware to build up features while the workpiece is mounted in the machine. A direct interface for shopfloor integration. Pow- erMill data such as NC programs, setup sheets MARK ALBERT | EDITORIAL DIRECTOR Autodesk's Sanjay Thakore presented an overview of Fusion Production. He emphasized that this cloud-based system combines production scheduling, job tracking and CNC machine monitoring using the Industrial Internet of Things into a single platform that is accessible in a web browser or by a mobile device.